Ok first of all, I just have to say - WOW!!! Taking part in a Hero Arts blog hop is FUN!!! I cannot even believe all the visitors and comments I've had on my blog this past weekend! I have a hunch it was more than I had the entire rest of 2009, LOL!! Thank you all for your sweet comments, I read and loved every single one of them!! 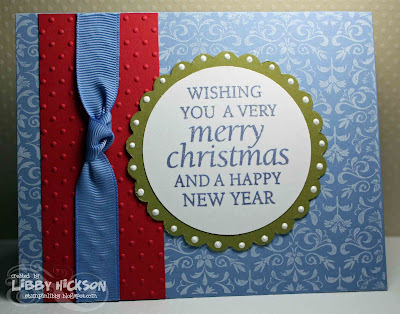 Paper: Brocade Blue, Real Red & Old Olive from Stampin' Up! Ink: Brocade Blue and Craft White from Stampin' Up! Libby, I can never get my ribbon knots just right, how do you get yours so perfect!!!! ?